The village salad is yet another crucial component of mezes in Cyprus. It may also be served as an accompaniment for a beef stifado. 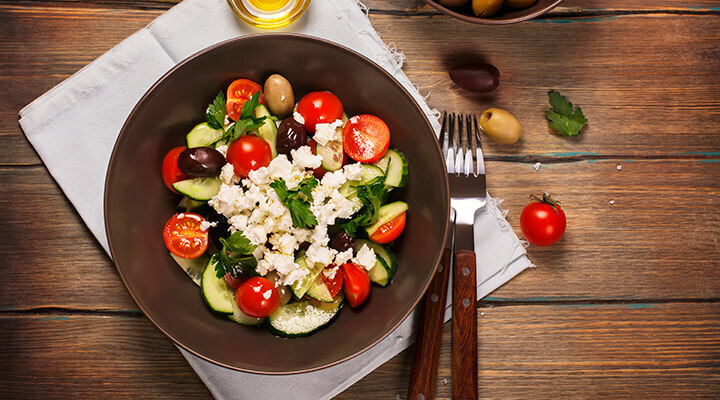 The Cypriot village salad is a variant of the Greek salad and is a light, refreshing salad that is suitable for almost any occasion. Other names for it include the country salad or the peasant salad. Typical ingredients include cucumbers along with tomatoes, lettuce, and feta cheese. Traditional preparation for a village salad involves cutting the tomatoes, feta cheese and cucumber into cubes rather than slices. Some chefs will add oregano or mint as a topping for the salad. Typical dressings consist of lemon juice or vinegar. Versions of the salad without lettuce are called horiatiki. One of the Cypriot touches that make a village salad different from a traditional Greek salad is the use of caper leaves. Caper leaves are often added instead of the capers that you would see in a Greek salad. Cut the tomatoes into wedges and peel and section the cucumber. Slice the onion into thinly sliced rings, this can form the base of the salad. Core the capsicum by cutting around the stem and cut it into slices like the onion. Build the salad up by adding cubed feta, parsley, caper leaves and olives to the top. Dress in olive oil, oregano, lemon and/or vinegar (Optional).